For the software framework, see Physalis (software). "Ground cherry" redirects here. For the European shrub also called "ground cherry", see Prunus fruticosa. Physalis (/ˈfaɪsəlɪs/, sometimes /faɪˈseɪlɪs/) is a genus of flowering plants in the nightshade family (Solanaceae), which grow in warmtemperate and subtropical regions of the world. Most of the species, of which there may be 75-90, are indigenous to the New World with one notable exception (P. alkekengi). Cultivated species and weedy annuals have been introduced worldwide. A notable feature is the formation of a large papery husk derived from the calyx, which partly or fully encloses the fruit,. The fruit is small and orange, similar in size, shape and structure to a small tomato. At least 46 species are endemic to the country of Mexico. Many Physalis species are called groundcherries. 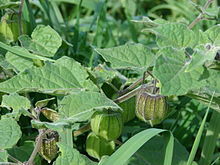 One name for Physalis peruviana is Cape gooseberry, not to be confused with the true gooseberries, which are of the genus Ribes in the family Grossulariaceae. Another name used to refer to the fruit is simply golden berries. Physalis are herbaceous plants growing to 0.4 to 3 m tall, similar to the common tomato, a plant of the same family, but usually with a stiffer, more upright stem. They can be either annual or perennial. Most require full sun and fairly warm to hot temperatures. Some species are sensitive to frost, but others, such as the Chinese lantern, P. alkekengi, tolerate severe cold when dormant in winter. These plants grow in most soil types and do very well in poor soils and in pots. They require moisture until fruiting. Plants are susceptible to many of the common tomato diseases and pests, and other pests such as aphids, whiteflies, spider mites, and the false potato beetle (Leptinotarsa juncta) also attack them. Propagation is by seed. Some species are self-incompatible and requirepollen from other plants to bear fruit. Not all Physalis species bear edible fruit. Select species are cultivated for their edible fruit, however; the typical Physalis fruit is similar to a firm tomato in texture, and like strawberries or pineapple in flavor, with a mild acidity. Some species, such as the Cape gooseberry and tomatillo have been bred into many cultivars with varying flavors, from tart to sweet to savory. Physalis fruit are rich in cryptoxanthin.The fruit can be used like the tomato. Once extracted from its husk, it can be eaten raw and used in salads. Some varieties are added to desserts, used as flavoring, made into fruit preserves, or dried and used like raisins. They contain pectin and can be used in pie filling. The Cape gooseberry is native to the Americas, but is common in many subtropical areas. Its use in South Africa near the Cape of Good Hope inspired its common name. Other species of commercial importance include the tomatillo (P. philadelphica). Some nations, such as Colombia, have a significant economic trade in Physalis fruit. Some species are grown as ornamental plants. For example, the hardy Physalis alkekengi is popular for its large, bright orange to red husks. In Chinese medicine, Physalis species are used as remedies for such conditions as abscesses, coughs, fevers, and sore throat. 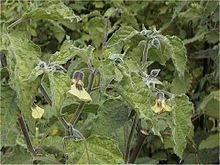 Smooth groundcherry (P. subglabrata) is classified as a hallucinogenic plant, and its cultivation for other than ornamental purposes is outlawed in the US state of Louisiana under State Act 159. The extinct Dacian language has left few traces, but in De Materia Medica by Pedanius Dioscorides, a plant called Strychnos alikakabos (Στρύχνος άλικακάβος) is discussed, which was called kykolis (or cycolis) by the Dacians. Some have considered this plant to be Physalis alkekengi, but the name more likely refers to ashwagandha (Withania somnifera). As of 2005, about 75 to 90 species were in the genus. ^ Jump up to:a b "Genus: Physalis L.". Germplasm Resources Information Network. United States Department of Agriculture. 2009-09-01. Retrieved 2010-04-14. ^ Jump up to:a b Whitson, M. and P. S. Manos. (2005). Untangling Physalis (Solanaceae) from the physaloids: a two-gene phylogeny of the Physalinae. Systematic Botany 30(1), 216-30. ^ Jump up to:a b c Vargas, O., et al. (2001). 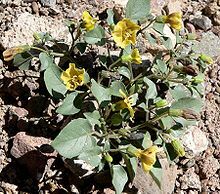 Two new species of Physalis (Solanaceae) endemic to Jalisco, Mexico. Brittonia 53(4), 505-10. ^ Jump up to:a b "Physalis". Integrated Taxonomic Information System. Retrieved 2011-05-21. Jump up^ Doctor, Vikram (4 March 2013). "Golden berry: Decoding the acid freshness and wild sweet taste of physalis". The Economic Times. Retrieved 6 Sep 2014. Jump up^ Duke, J. A.; Ayensu, E. S (1985). Reference Publications, Inc., ed. Medicinal Plants of China. ISBN 0-917256-20-4. Retrieved 2009-05-15. Jump up^ Berendes, J. (ed.) Arzneimittellehre in fünf Büchern des Pedanios Dioskurides aus Anazarbos. Stuttgart. 1902. 405-08. ^ Jump up to:a b c "GRIN Species Records of Physalis". Germplasm Resources Information Network. United States Department of Agriculture. Retrieved 2011-05-21. Wikimedia Commons has media related to Physalis. "Groundcherries, (cape-gooseberries or poha), raw". Nutrition Facts. Self Nutrition Data. Coloque os morangos, framboesas, mirtilios, raspa, sumo e metade do adoçante numa tigela. Misture bem. Deixe ficar por 10 minutos, para marinar. Aqueça uma grelha em lume alto. Torre ambos os lados do pão ate ficar dourado. Barre 1 lado de cada fatia com o requeijão de Seia ou ricotta. Cubra com a mistura de frutos vermelhos. Regue ou polvilhe com o restante adoçante e decore com a hortelã.